Arizona has canceled a vaccine education program due to complaints lodged by parents who don't immunize their children. The online course was modeled on a program already in place in Oregon and Michigan. The purpose of the course was to combat the rising number of Arizona parents choosing not to ignore school-required immunizations. The course was to be optional, but some parents worried that it would eventually become mandatory and filed complaints with the Governor's Regulatory Review Council. Council members questioned the state health department following the public feedback and the state, in turn, decided to cancel the program outright. There were around 120 total individuals and families who spoke out against the voluntary course on mandatory immunizations. Brenda Jones admitted in an email that the cancellation was in large part due to "a lot of political and anti-vaxx" feedback. The program had already been launched in 17 schools in three Maricopa County school districts last year and the plan was to continue expansion to schools in Pima, Yavapai and Pinal counties in the 2019-20 academic year. State health officials are now back at the drawing board hoping to find a new way to provide "evidence-based vaccine education" to Arizona parents in order to convince them that vaccines are "far safer than the diseases they prevent." 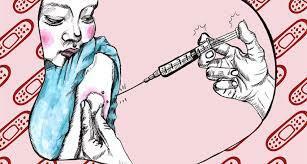 The vaccine itself may be all well & good, It`s all the other things added in that is bad. Ask yourself why does every vaccine have a hotline & payout plan for those killed or seriously affected by them? If the program was factual then you're a bunch of pussies to cancel just because someone was opposed to it. They didn't didnt have to listen, thats what doors are for get up and leave, knobs on TV's turn them off. What about the rights of the people who did want the information? Arizona is the destination of a lot of white flight, so no wonder they are becoming more and more based (in certain areas). Nice to see people in Arizona starting to wake up. This is great news. soo if these guys preffer their sons suffering these disseases instead of the small posibility of autism, then yeah, its a victory for them, people has spoke!